Srinagar measured 36 mms on Sunday and 10 mms on Saturday..46 mms in last 2 days.Day's high was 3.4c. Saturday 7th: Gujrat City in Pak saw a max of 15.5c on Saturday (Vagaries' estimate was 18c), and 22 mms against forecasted 20-25 mms. Islamabad saw 28 mms on Saturday, with another 7 mms on Sundayagainst estimated 50-55 mms for Sat and Sun combined.Karachi had no rains. Delhi Sjung measured 14 mms and Palam 19 mms. Meerut 17 mms and Hindon 8.6 mms. Some Northern parts had no rainfall. March seems to be getting off to a wet start ! Already last week's rains are keeping the day temperatures below the normal for this time of the year. Another spell of rains coming ....and Aurangabad will be getting another rain spell on Monday 9th March. This time, the rains will be persisting till Wednesday. Cool and cloudy days will be the start of next week.Wednesday will be cool. Would expect around 15-20 mms in 3 days of rainfall. The mentioned trough / wind discontinuity in Vagaries in the lower levels runs from Lakshadweep area to west Madhya Pradesh across coastal & north interior Karnataka and interior Maharashtra. The expected Western Disturbance M-2 Moves into Pakistan from the West on Saturday 7th. A deep trough at 200 hpa level, and an induced Low over Punjab at Sea level brings Rainfall spreading from Balochistan into Pak Punjab by evening. Sunday sees the WD continue to bring good precipitations to North Pakistan (Punjab) and move into Northern and NW India. Islamabad will see a wet weekend, thunder showers pouring around 50-55 mms this weekend. Saturday and Sunday. Gujrat City in Pak Punjab can expect 20-25 mms. Cool Saturday at 18c Max. .
Karachi: Cloudy on Saturday with light drizzles in parts of City. North winds dominate. Rains possible on Sunday 8th in Kashmir, HP, Punjab and Haryana and Northern Rajasthan. Sunday evening showers possible in N.I. Karnatak (Belgaum) and adjoining Southern regions of Maharastra. Late Sunday Night and early Monday 9th morning we see heavy rains in some parts of Pak Punjab (Gujrat City) and adjoining Western parts of Indian Punjab. Due to the LWD of North Winds from the WD and South/South East winds over Maharshtra, rains increase in Maharashtra from Sunday night to move into Marathwada (Aurangabad) and Vidharbha(Akola and Nagpur). Heavy spells in parts of both Punjabs on Monday 9th. Showers on 9th Monday pop up in Marathwada and Vidharbha. Some regions of Madhya Maharashtra, specially north get heavy showers. Possible to see some showers drift into Interior Central Konkan areas ( Roha, Panvel). Mumbai: May not see much clouding or rainfall till Wednesday. Weekend and into Monday, the day temperatures will rise to reach 32c, and nights may go up to 21c (from current range of 30c_ 16c at Santa Cruz). New Delhi: Weekend till Monday, partly cloudy, with stray shower in some parts of NCR on Saturday/Sunday. Gusty S/SE winds. Otherwise, day will be at 28c. Pune: As the day becomes warm this Sat/Sund at 33c, thunder showers in some parts will cool the city on Monday 9th evening. Rains on Tuesday also. Belgaum: Showers from Sunday night into Monday. Akola: The region will see a warm weekend with days possibly rising to 33/34c. But light showers on Sunday evening, and light rains on Monday will cool the atmosphere on Monday. Would expect around 5-7 mms rains from sunday night to Monday night. More rains and cloudy next week. Nagpur: Aftre a warm partly cloudy weekend, a thundershower possible on Sunday night. Maybe around 10 mms till Monday morning. Surat and Bharuch will be warm or hot. Possible showers by mid next week. The upper air cyclonic circulation over Lakshadweep and adjoining Maldives area extending upto 0.9 km above mean sea level persists. 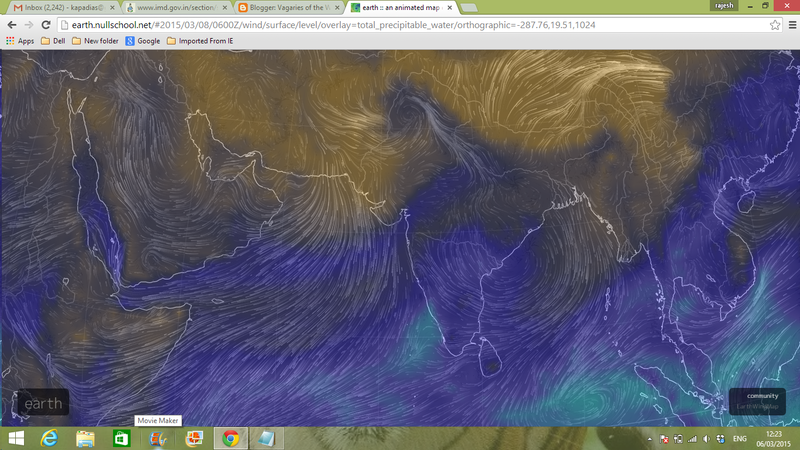 The cyclonic circulation extending upto 0.9 km a.s.l. over Lakshadweep-Maldives areas now lies over Maldives-Lakshdweep areas. Whenever, a system goes into Arabian Sea from Comrin Sea the steering winds lock the moisture over Coonoor valley and they get very heavy rains. Yesterday was no different. Sir mumbai to get rain after Wednesday? Hrishikesh: Good chances as of now. Thats why I gave estimate till Wed.Will keep updating. Pradeep: Good observations and thanks for the regular informations. Appreciate your efforts for Vagaries. great effort fr akola farmers. They have just been thru 100 mm + last weekend. Thank you sir will be waiting for the updates hopefully mumbai will get good rains and is there a chance of la nina this year ? Skymet early forecasts saying Good monsoon this year like 2013 for Mumbai and Maharashtra. Is it true Sir? Hrishikesh: Not La Nina, but El nino expected this year. Shall put up details on this next week. Abizer: Light rains in Roha and Pen on Wed and Thursday.Not much , upto 5 mms. Storm was more sevre in south ncr .Ballabgarh in faridabad had hailstorm with heavy rain.